Chancellor Cunningham with his daughter Tressa Cunningham, who earned a master’s degree at NU. In June, the National University System (NUS) recognized more than 3,000 graduates who crossed the stage at three separate commencement ceremonies. 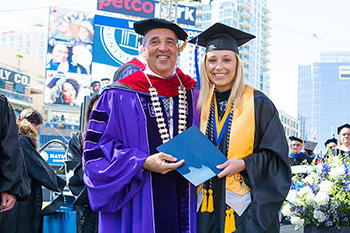 On June 17, National University held its Southern California commencement ceremony at Petco Park in San Diego, and that same day graduates from City University of Seattle received their degrees in Seattle’s Key Arena. On June 24, we celebrated John F. Kennedy University graduates at the Paramount Theater in Oakland, CA. I’d like to thank our Board of Trustees, University presidents and more than 5,000 NUS faculty and staff who work tirelessly to bring quality education programs to our students. Together, we are able to create new opportunities for our students and alumni to pursue their lifelong learning goals. I am so proud of all of our graduates and was honored to congratulate them and meet their families who supported them along the way. This year brought added excitement for me personally, as my daughter Tressa graduated from National University with a master’s degree in criminal justice. It was a special moment to hand her a diploma as she crossed the stage and to hear her enthusiasm and appreciation for the faculty and staff who motivated her and taught her so much throughout her journey. 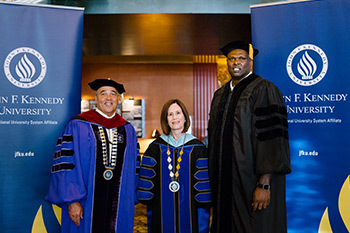 Former Golden State Warrior and JFKU alumnus Adonal Foyle receives an honorary doctorate from Chancellor Cunningham and JFKU President Debra Bean. Commencement provides an opportunity to honor the achievements of graduates reaching their educational goals. I always leave feeling even more inspired after hearing stories of how our students persevered through various challenges to reach this point. This year, the keynote addresses at National University and John F. Kennedy University were delivered by alumni from each institution. San Diego City Council President Myrtle Cole received her MBA from NU and shared the importance of pursuing one’s passion in life despite any adversity one may encounter. At JFKU, former Golden State Warrior Adonal Foyle discussed education as the foundation of opportunity and happiness. Graduates were encouraged to always keep striving and learning in life. Both speakers received honorary doctorates from their alma matters in recognition of their leadership and public service efforts within their communities. 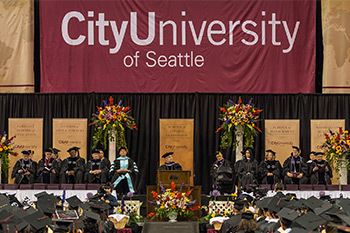 CityU President Randy Frisch addresses graduates at the Key Arena on June 17. We celebrate the diversity of our student population at NUS, which was evident as we watched wives, husbands, mothers, fathers, grandparents and members of our armed forces cross the stage at these ceremonies. We also celebrated those graduates who couldn’t join us because they are bravely serving our country overseas. In addition to congratulating those students, I also want to extend a special congratulations to our international students, many of whom graduated from City University of Seattle this month. We were thrilled to welcome esteemed guests from CityU’s partner universities in Mexico, including CETYS Universidad, to the commencement exercises in Seattle. All together, we have over 40,000 dedicated students in the National University System, and we believe that it’s not just the degree you earn, but the degree to which you use it. We all have the responsibility to use our skills and talents for the greater good, and as the graduating class of 2017 takes the next step in their lives, I am confident that they will make us all proud, just like I am proud of the faculty and staff who remain dedicated to educating the next generation of change makers and community leaders.